Select from our Amish playset packages below and follow the 2 Easy Steps! Step 1: Select playset and enter your zip code to view price. Step 2: Select your options and accessories. Put a smile on your child's face, and invest in a quality Amish-built Adventure World Gymsets vinyl playset or a handcrafted Outdoor Play Systems wood swingset. *20-Year Warranty on all Vinyl Playsets! Gift Certificate - the perfect gift! Wood Playset Country Cabin - A Best Seller! Single Level Decks with 5' Heights. Split Level Decks with 5' and 7' Heights. Triple Level Decks with 5' and 7' Heights. Please note: we are not responsible for ordering errors due to technology or internet server issues, or printing errors. If in doubt, please verify all pricing with us before placing your online order. 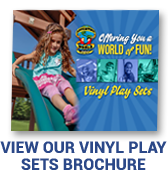 *20 Year Warranty on all Standard Vinyl Playset Packages with product registration. *Wood Playsets include a 2-Year Warranty. Wood Playsets include REDWOOD STAIN as a standard. Ask about our Rubber Mulch Installation! 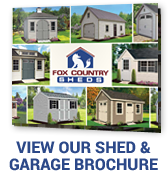 Contact Fox Sheds or Lancaster Swingsets today to provide a quote for your rubber mulch delivery, custom border and site preparation, and vinyl swingset package. 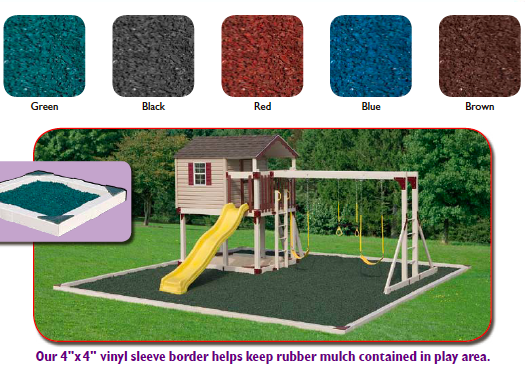 Our 4"x 4" vinyl sleeve and rubber mulch border helps keep rubber mulch contained in play area.. Optional heavy-duty fabric base under the mulch prevents weeds and still allows drainage. Rubber Mulch… a breakthrough in playground and landscape surfacing. In an effort to preserve the environment, our unique rubber granule product is recycled from 100% scrap tires. Parents love our rubber mulch because it’s safe for kids and pets, economical, long-lasting and environmentally friendly. Our Rubber Mulch conforms to all CPSC safety guidelines and has earned ADA approval, making our playgrounds safe for our children while preserving the environment. Rubber Footing is the most economical playground safety surface which is lifetime guaranteed. Our Rubber Mulch retains its resiliency year round and is available in an array of vibrant colors to enhance your playground. It's effectiveness in reducing playground injuries has been proven as a safe playground safety surface, so parents can now relax while their children are having a great time! Colorful mats help minimize erosion under swings or at the bottom of slide exit. Provides extra protection for shock absorption. *Due to the recent fluctuating fuel costs, shipping charges may vary. Upon your order confirmation, we will verify exact shipping costs with you.